Narayani Impex office wide range of Roller Guide Box, That can be used for continuous rolling operation, where the stock being rolled is properly twisted between each two adjacent rolling mills. These boxes are offered with heavy duty taper roller bearing for larger sections. - Cast Iron / Mild Steel I Stainless Steel Casted. Cassette Mounted Roller Guide Box: Cast steel box with leaf sprigs, rocker rollers, entry guides , lubricating and cooling system. used for guiding of most symmetrical sections E.G. rounds, ovals . squares, flats, etc. We provide all kinds of guiding equipments that are extensively used in rolling mill plants.We design Entry Guide Boxes of series 820, 830 and 845 as per international standard design.Similarly we also provide delivery guiding equipments as per clients needs and requirements. Guide Box is available in various sizes of stainless steel to meet the requirements of engineering industries. Our products range also covers a wide range of Roller guide Boxesfor various applications, We present our unique collection of high quality Roller Guide Boxes, which are rated high in terms of quality and accuracy. used in steel rolling mills for producing TMT and bars. 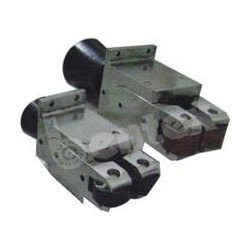 We are a well-known company of the industry, tremendously involved in Manufacturing and Supplying unbeatable quality Roller Guide Box. The products offered by us are fully capable in meeting the dynamic expectations of the customers in the best possible manner.